A strategically placed bucket to catch drips may be an effective leaking roof repair for the short term, but the damage could soon shift from a simple repair to requiring a total replacement. 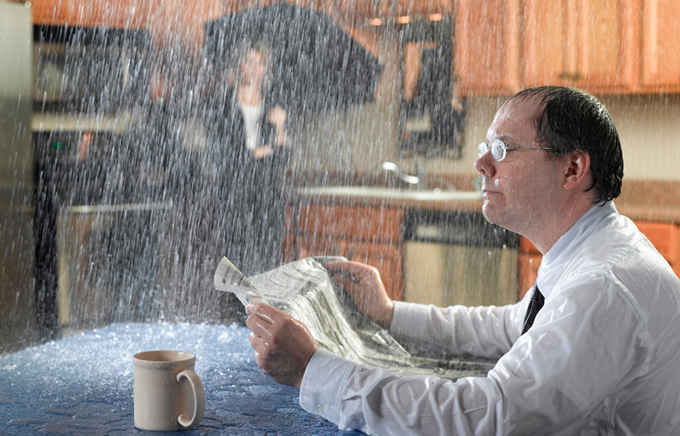 When water is dripping through your ceiling it means that the protective barrier of your roof has been compromised. This usually results from shingles that have blown off in extreme winds, flashing that has allowed water to seep behind, or a roof membrane puncture (or roof seams becoming unglued / coming apart) that is opening up an unwanted access point to rainwater. As you can probably imagine, many homeowners despise paying for a roof because it offers little enjoyable value as a project. Well, besides avoiding getting wet, not having the wood in your house rot, fending off mold and mildew growth, providing energy efficiency, etc. According to RoofingCalc, the average cost most consumers reported paying for a roof repair was between $350 to $1,000, or about $675 for a typical roof repair project. As expected, some repairs can cost much lower than the average, requiring only a simple application of caulk or roof cement to seal the source of a leak. On the other hand, some roofs can be so badly damaged by storm winds or hail that they require a complete replacement, which could cost as much as $9,000 – $15,000 or more. The size of the total roof area to be repaired/replaced will dictate how much the repair will cost. Other variables include roof accessibility and pitch, the choice of replacement material, and the amount of labor required based on the scope of the problem. Roof Size – As long as problems are limited to a small area, roof size doesn’t necessarily affect repair costs. If wind, rot, and other issues attack a whole side of the roof however the higher the prices. Roof Pitch – Roof access will increase the costs of the labor required to repair the roof. Quite simply put, work goes slower on a high, steep roof and requires harnesses, the rental of special equipment, and often times a larger workforce to lessen the points between crew on the roof, middle men, ground workers, etc. Some roofing crews will bid up to double their hourly rate ($50-$75/hr normally) on a highly-pitched roof, almost as a way to ‘hope’ not to get the job. Materials and Labor – Labor and materials are going to be your two major cost points in roof repair (with the possibility of permits (up to $400), disposal ($100 min for 60ft3), and a few other miscellaneous line items). Just as material costs will dictate how much a new roof installation is going to cost, it also does so with repair. If you need to purchase replacement materials, it can cost: asphalt ($100 per roofing square), metal ($200-600 per square), wood ($350-$450 per square), tile ($300 to $800 per square depending on concrete or clay), slate ($1,100+ per square). Scope of Work – You’ll also need to know the scope of the work if it involves simply replacing a few shingles and applying caulk or replacing rotted plywood sheathing ($15-$20 per sheet) and other repairs. Asphalt Shingles – as asphalt shingles wear over the years of weather exposure, the granules start to erode and the edges of the pieces start to curl. High winds can also rip asphalt shingles from the substrate, especially if they were fastened too high above the nailing strip. When an asphalt roof fails as a whole due to wear, there are generally no repair options besides complete replacement. When sections of the shingles blow off or become damaged replacement costs about $100 per roofing square. Metal Roofs – the biggest problem befalling metal roofs is the fasteners working themselves loose after years of expansion and contraction. This is generally an easy solution requiring the attachment of a new fastener and some caulking (labor). The ribs of the metal can also become dented and damaged if hit by an object such as a falling satellite dish or trees. Replacing metal sheets is rarely done because of the difficulty in matching colors of new with UV exposed products. Wood – cedar shakes and other wood roofing types are very apt to deterioration and breakdown from mold buildup, mainly in areas of the home that are heavily shaded. A lack of sealing and other required maintenance may also leave some wood roofs prone to insect infestation. Replacement is generally the best repair costing about $350 to $450 per square. Tiles – tiles, especially clay, are most often damaged by foot traffic when accessing the roof. Although they are durable against normal weather, the tiles are also very brittle against collisions and impact. Tiles can also become damaged when freezing after becoming wet or can simply slide away from the roof if not fastened properly. Repairs are very difficult because of the fragility of walking on the tiles, possibly causing more damage than initially sent to repair. Damaged tiles will need to be replaced at $300-$800 per square. Slate – some slate types (Buckingham) have a life expectancy of up to 175 years but others (Ribbon) can be as low as 20 years. It’s important to know what type of slate is installed on your roof before you determine that it is a ‘lifetime material.’ Slate tiles become soft and soggy as they are nearing their end of life. Slate can become cracked or de-laminate which will require a replacement as will pieces that slide after becoming disconnected from a nail. Costs will vary greatly depending on finding a matching material type. Flat Roofs – another roof type needing frequent repair is a rubber or membrane surface. These are generally installed on flat roofing surfaces, so even the slightest of issues can cause leaks. Most small tears and holes can be fixed with a roofing cement as can corners that lift up. A substrate that sags will collect water and leave the different roofing types more apt to rot from mildew growth. Patching and the application of a new seal will cost a varying amount in material in labor costs. Many times the cause of your leak will have nothing to do with material failure at all. While this will usually lower repair costs, it also requires a more in-depth inspection to find the true source of the problem. Also since many roofing components (fascia, soffit) are made of thin aluminum they must be replaced instead of repaired when undergoing damage by insects, rodents, or Mother Nature. Fascia is replaced at about $20 per 8ft, while soffit repairs are done for $20 for every 12 feet. Gutter damage must also be repaired at a cost of roughly $12 for every 10 foot section including the hangers and joiners. Flashing is one of the most common roofing repairs performed, because it is such an influential component to prevent leaks around skylights, chimneys, transitions, windows in dormers, and more. Large sections of aluminum flashing are also used in valleys and with the installation of clay tiles. Did you know? Improper installation of flashing is the most common cause for repair, but the failure of sealant can also contribute to leaks. Professional roof repairs SHOULD involve a thorough inspection and often removal of material surrounding the flashing to fix the issue. Buying and bending new pieces, reinstalling roofing materials, and properly sealing the area often makes flashing repair a day+ job costing $200-$500 or more. Costs of materials needed and specifics of materials to be purchased. Costs of permits, clean-up, etc. Provisions for any change orders or add-ons if extras are needed once work starts. By having this detailed information on a roof repair bid you can compare where the costs are coming from for multiple contractors. You’ll also have the peace of mind that they all diagnosed the correct problem. If one contractor says the damage is from flashing while the other says it’s from material failure, you’ll know to investigate the issue more thoroughly before agreeing to the work. The best bet is to get as many estimates as possible. There is a number set for average roof repair costs, but the scope of that average repair varies widely.